Maintenance of vitreous enamel steel surfaces. Always adhere to the care instructions supplied by the manufacturer with your product. 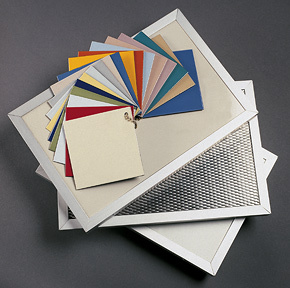 Vitrex's vitreous enamelled steel surfaces require very little maintenance. We recommend that the enamel surface be cleaned on a regular basis (say every six months) with a basic soapy solution (i.e. dish washing soap, such as Sunlight or Ajax, and warm water) applied with a soft sponge and then rinsed. In general, ammonia based cleaners, such as Handy Andy, should be avoided as they tend to dull the surface and can leave a residue behind. In the case of more stubborn marks, we would suggest first the use of either Paint Thinners or Alcohol followed by a final cleaning down as described above. The use of any acid based solvents should be avoided. In the event that you do not have the care instructions or are cleaning an old enamelled product then test the cleaning products on a small area first before applying them to the entire surface area of the product.